There are many different things you can do for yourself when it comes to self care. Some like a massage, while others like cuddling on the couch to binge watch their favorite show on Netflix. I love a bit of everything. On days where I get to relax without hearing a kid yell, "MOM!" multiple times a day, one of my all time favorite things to do is to relax in a bath with a glass of wine, my favorite 90's songs from when I was a teen and some nice bath products that help hydrate my skin. I was super excited when I received a few of Hallu's new products that made my "me time," even more relaxing. They sent over their Rainbow Sugar Scrubs, Wish Upon A Star Bath Bomb and Mermaid Tiki Torch Bath Bomb. Their Rainbow Sugar Scrubs is made with natural honey and sugar to exfoliate, rosehip and coconut oil to soften and moisturize your skin. Using the sugar scrubs during my bath felt great and I love how vibrant and colorful the sugar scrubs are not to mention how great they smell. The sugar scrubs were amazing to use. 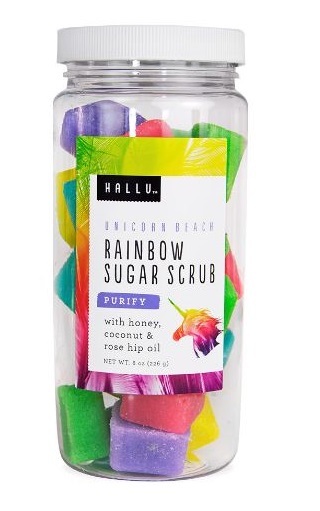 While using the scrubs I made sure to scrub down harder on the parts of my skin that were a little rough from our harsh Winter, but I love how soft and smooth my skin felt after and I can't wait to use the Rainbow Sugar Scrubs again. 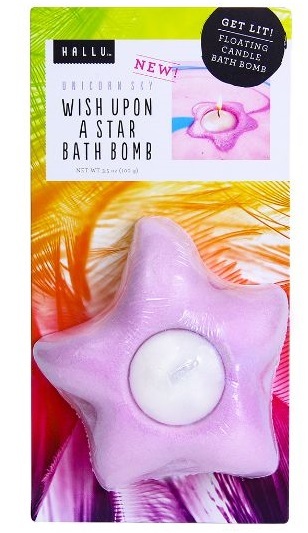 Next up is their Wish Upon A Star Bath Bomb, retailed at $4.97. This bath bomb is one of the many new products that Hallu will be debuting at the end of this month. It adds color and a soft glow to your tub with the help of the lightable candle that's included. With its soothing hibiscus and water lily fragrance, this bath bomb is sure to slowly transforms the waters around you into a beautiful unicorn sky. This was my first time using a bath bomb that had a candle inside it and I have to say I'm definitely a fan. It made my bath even more enjoyable and I love that it floats, leaving you feeling nice and relaxed. 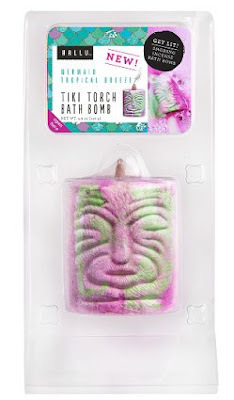 Lastly, the Mermaid Tiki Torch Bath Bomb, retailed at $5.97, is another new product from Hallu, was enjoyed by my teenage daughter who absolutely loved it. The mermaid Tiki Torch Bath Bomb floats, spins and bubbles, giving you that relaxing spa time we all deserve. Its Palo Santo incense provides energy, cleansing and spiritual purification to the air and the bath bomb contains Myrtle and Almond Oil for extra moisturizing benefits. To use, light the incense until the room is filled with the desired amount of fragrance and then add the bath bomb to your bath to dissolve and enjoy the beautiful pink, purple and green colors as the oils moisturize your skin leaving your skin feel nice and soft. The new bath products from Hallu will be available at Walmart on March 30th and on March 23rd Kroger stores exclusively debuted three new Hallu bath bombs along with 13 other Hallu products including top sellers Unicorn Rainbow Sugar Scrub, Mermaid Spray Lotion and Fairy Pink Foam Lotion. Be sure to try these beautiful inexpensive bath products the next time you treat yo' self. Great review,these looks interesting ! Thanks Kathy, they were so relaxing to use! Absolutely loved them. I hope you get to try them soon. They're pretty awesome to use. The bath bombs are so relaxing.